How Do I Wire a Siemens Breaker Box? The term "hardwiring" relates to the way in which an appliance is hooked up. 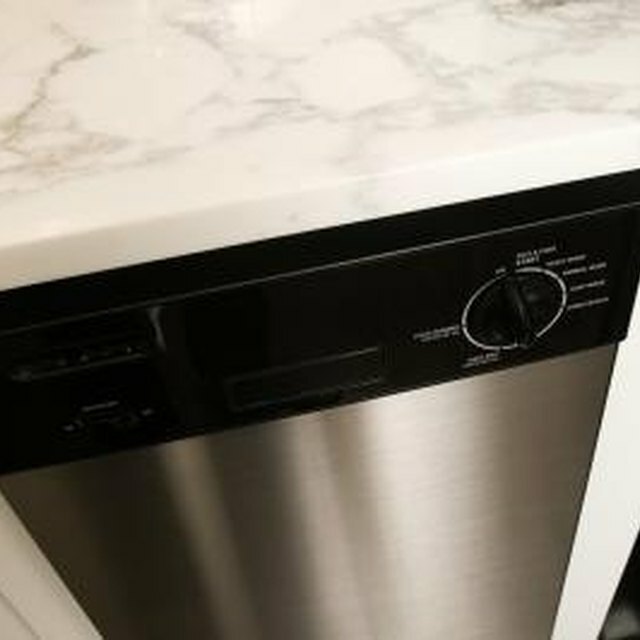 To hardwire a dishwasher means to connect the machine directly to the circuit wire that leads to the home's electrical panel, rather than simply plugging the dishwasher cord into an electrical outlet. Not all types of appliances in your home can be hardwired, but a dishwasher is one of them that can handle this type of hookup. Thorough knowledge of household electrical wiring is needed for this project. When installing a new dishwasher, take the time to learn how to hardwire it so that the dishwasher runs effectively and efficiently. Underneath the dishwasher you'll find the hardwire cord. Identify the electrical circuit on the breaker panel that leads to the dishwasher and shut off the breaker to that circuit. This ensures that you do not get electrocuted when working with the wires and cords. Your electrical panel may be located in the basement of your home or in a special closet. Drill a 3/4-inch hole in the back of the right side of the cabinet where the dishwasher is being installed. Sand the edge of the hole smooth with medium-grit sandpaper. Run the dishwasher wire through the hole and into the wiring junction box. Convert an outlet box into a terminal box, if a terminal box isn't already behind the dishwasher. A terminal box is where the connectors go and the box cover provides weatherproof protection so that the wires don't become damaged from water behind the dishwasher. Remove the outlet faceplate by unscrewing it from the wall. Remove the receptacle using a screwdriver, pull out the receptacle and remove the wires from it by loosening the connection screws. You will end up with a box in the wall and wires sticking out. Create a new circuit if one does not exist for the dishwasher. Run electrical cable from the circuit box through the wall behind the appliance. Cut a hole in the wall and [install a junction box](https://homesteadycom/how-2073609-install-junction-boxhtml) by attaching it to a stud. Run the dishwasher electrical cable to the box. Identify the grommet at the bottom of the box. This is the space where the electrical wires from the wall and the wires from the dishwasher will pass through in order to be connected to the terminal box to make a hardwire connection. Strip approximately one inch off the jacket of each of the three wires within the two cables using wire strippers in order to fit it into the cage clamp. Splice the corresponding positive, negative and ground wires to each other and insulate each splice with a wire cap. If you are unsure how to do this, consult a professional. Push the dishwasher appliance partially into the cabinet, being sure to not kink the wires that are in place so far. Attach the cover of the junction box using the provided screws. Familiarize yourself with electrical wiring concepts and methods prior to hardwiring a dishwasher, since this type of project is usually completed by a professional electrician. Make sure the electrical circuit is "dedicated" to the dishwasher only. Also make sure the circuit is the proper voltage and amperage for the appliance. Make sure the installation complies with local safety and electrical codes. Keep the power cord supply out of touch from the dishwasher motor.